The wife of a U.S. soldier accused of killing 17 Afghan civilians says her husband showed no signs of post-traumatic stress disorder before he deployed, and she doesn't feel like she'll ever believe he was involved in the killings. "I just don't think he was involved," Karilyn Bales said in an interview with Matt Lauer that aired during Monday's NBC Nightly News broadcast. "I don't know enough information. This is not him. It's not him." Earlier, she said on NBC's Today show that she didn't know much about PTSD symptoms. "He doesn't have nightmares, you know, things like that. No dreams," Karilyn Bales said. She defended her husband, Staff Sgt. Robert Bales, in the weekend interview. Officials say Bales left his base March 11 in southern Afghanistan and killed eight Afghan adults and nine children. The wife of the Joint Base Lewis-McChord soldier said the accusations are "unbelievable to me." "He loves children, he's like a big kid himself," she said. "I have no idea what happened, but he would not … he loves children, and he would not do that." He was formally charged Friday with 17 counts of premeditated murder and other crimes, and is being held at a U.S. military prison at Fort Leavenworth, Kan.
Karilyn Bales was in a grocery store when she first heard of the rampage in a phone call from her parents. "They said, well it looks like a U.S. soldier, some Afghan civilians were killed by a soldier," she said. She learned more when she got home. "I saw 38-year-old staff sergeant, and I don't think there are very many of those, and I probably prayed and prayed that my husband wasn't involved," she said. "And then, I received a phone call from the army saying that they would like to come out and talk to me. And I was relieved, because when you get a phone call, you know that your soldier is not deceased." She was told about the shootings. "They held my hand and they just said that perhaps, you know, they thought that he had left the base, and gone out and perhaps killed the Afghan civilians, and that was really the only sentence, and I just started crying," she said. The deaths of the nine Afghan children are especially difficult, she said. "It's heartbreaking. I can't imagine losing my children, so my heart definitely goes out to them for losing all of their children." Bales was on his fourth tour of duty in a war zone, having served three tours in Iraq, where he suffered a head injury and a foot injury. Karilyn Bales said his last deployment was more "secretive" and "more intense." His civilian attorney, John Henry Browne, had said the soldier and his family had thought he was done fighting. "It was a big shock because we weren't on the schedule to be deployed again, to be honest with you. He didn't want to miss out on any more of his kids' life," Karilyn Bales told Today. Bales said she feels he was mentally fit when he was deployed. He never told her about a traumatic brain injury he suffered while in Iraq, until he returned home. "Not until he came back and said that he, you know, had been blown up," she said. "He shielded me from a lot of what he went through. He's a very tough guy." 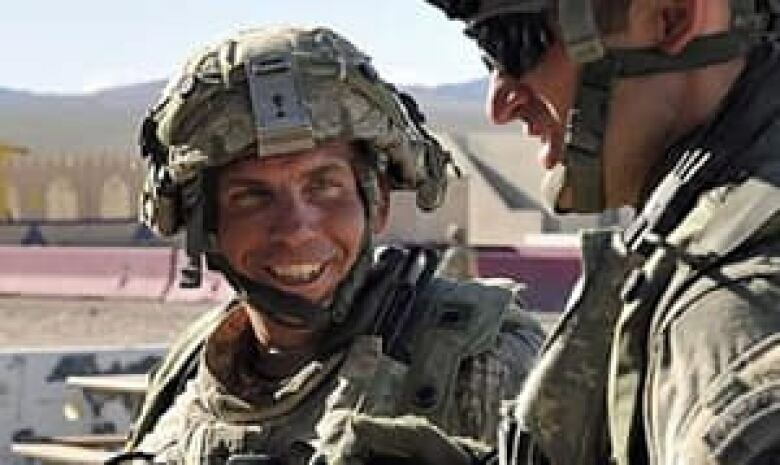 U.S. investigators have said they believe Bales killed in two episodes, returning to his base after the first attack and later slipping away to kill again. He is reported to have surrendered without a struggle. Karilyn Bales has spoken to her husband by telephone twice since he was detained. The soldier called his wife first from overseas shortly after the massacre, and then last week from Fort Leavenworth. They didn't talk about what happened, she said. "Not on the monitored phone call. So we couldn't discuss those details. He was — seemed a bit confused. As to where he is and why he was there," she said. She says he'll probably tell her about it when they meet. "I don't think anything will really change my mind in believing that he did not do this. This is not what it appears to be," she said. The couple has two young children, a girl named Quincy and a boy named Bobby. They are now living on the base at Joint Base Lewis-McChord. The Bales family had a Seattle-area home condemned, struggled to make payments on another and failed to get a promotion a year ago. Karilyn Bales put the family's Lake Tapps, Wash., home up for sale days before the rampage. The youngest of five brothers, Bales grew up in the working class Cincinnati suburb of Norwood, Ohio. He joined the army two months after the Sept. 11 attacks, after a Florida investment business failed and after he had worked with a string of securities operations. Karilyn Bales told the Today show she has set up a fund to help pay for her husband's legal defence.